For particularly fortunate neurologists, avocations and passions complement medical practice to create harmony in their daily lives. Whether an intentional quest or the result of serendipity, those who have managed to find the right balance describe themselves as more fulfilled in the workplace. 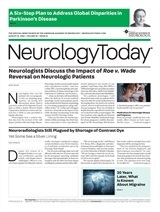 For the first of this two-part article, Neurology Today spoke with neurologist musicians, artists, writers, and others who discovered a way to integrate their non-medical talents and interests with their day-to-day practice and, often, with family life as well. Michael E. Charness, MD, Chief of Staff at the VA Boston Healthcare System, knew that few spouses would tolerate his devotion to musical practice when he returned home after a 15-hour work-day. So when he was set up with a professional flutist on a blind date after the 1982 AAN Annual Meeting, he proposed to her within hours. He and his wife, Deborah, soon began to give recitals together. They started each of their three children in musical studies at the age of four, and the Charness Family Quintet, who have their own Web site, www.charnessfamily.net, now practices together evenings and performs nearly every other Sunday. Although his primary research has focused on the effects of alcohol on the nervous system, Dr. Charness first became interested in neuromuscular problems in musicians 20 years ago when he developed a subtle hand problem that interfered with his performance and seemed to stump clinicians. His temporary difficulties, eventually resolved by successful ulnar nerve release, became the seed of a growing fascination with the then nascent field of performing arts medicine. He was soon seeing a growing stream of musicians in the back of his laboratory – then at the University of California-San Francisco – where he provided them with free consultations. “I had no experience in the area, but learned as I went along,” he said. When he moved to Boston in 1989, he got his first real clinic, which later evolved into the Performing Arts Clinic at the Brigham and Women's Hospital. He now serves as its Director. Richard J. Lederman, MD, PhD, Professor of Medicine at the Cleveland Clinic Lerner College of Medicine of Case Western University, has been playing the violin and performing in chamber music groups for over 50 years. In the mid 1980s, Dr. Lederman and colleagues in rheumatology and orthopedics set up a clinic for instrumentalists, which has been in existence ever since. He met Alice Brandfonbrener, MD, in 1983 when he attended her conference on medical problems of musicians, and formed a collaboration that continues today. They jointly sponsor the conference and have authored two editions of a textbook on the subject. Over time, Dr. Lederman has seen over 1,500 instrumentalists for various disorders including muscular pain syndromes, nerve entrapments, and focal dystonias. Dr. Gutmann, an avid jogger, said, “Running is a quiet time when thoughts seem to flow freely and sometimes on their own. It is a time when concepts evolve. The idea of axonal channelopathies, which resulted in a lead review in Neurology some years ago, occurred to me during a run, as have some of my stories. I can go miles without recalling what I have passed because I am so engrossed in thoughts and ideas.” His wife, Mary, a writer and former editor, was initially his tutor in creative writing; she is now his editor and advisor. Arthur H. Ginsberg, MD, a neurologist who has been in practice in Seattle for the past thirty years and is a published poet, also finds inspiration from neurology. Dr. Ginsberg, who wrote “Locked-In Syndrome” for a recent Nisus entry and whose work appears regularly in the anthology Blood and Bone from University of Iowa Press, published his first book of poetry, Walking the Panther (Northwoods Press), in 1984. R. Allison Ryan, MD, PhD, a neurologist in practice in Northampton, MA, and a photographer, has always been interested in brain processing of imaging and, in fact, did her PhD research on the neurophysiology of visual perception. She began to display her work professionally four years ago after winning second place in a photography contest. Dr. Ryan incorporates photography into her other passions which include sports and travel. Dr. Ryan describes her waiting room as one in which patients don't mind waiting. It is wallpapered with her photographs and elicits much enthusiasm and praise from patients. His group practice setting allows him to frequently leave the office by 5 p.m. in time for the “sweet light” sought by photographers. He regularly sets out for the shore in search of birds, often waiting watchfully in a blind (small tent) in order not to frighten his subjects. Dr. Bahamon, who won first prize for his photograph of a bald eagle in Wild Bird magazine in 2004, often travels to Central and South America in search of the most colorful birds, at times accompanied by family members. “Art is a great relief from neurology, but it is curiously complicated. And so at times, neurology is also a great relief from the art,” Dr. Breuer, said. Dr. Breuer, who displays his art in juried shows regularly, describes his work as conceptual, semi-abstract, and grounded in the nature of reality, energy and matter, space, and time. Arani Bose, MD, and Steven Pacia, MD, met during neurology residency at Yale University. They both ultimately completed fellowships at New York University, where Dr. Pacia is currently Associate Professor in Neurology and Director of the Clinical Neurophysiology Fellowship, and Dr. Bose practices as an interventional neuroradiologist. They shared a common interest in contemporary Indian art and, after many trips to India, decided to open an art gallery to feature avant-garde contributions of artists from South Asia. As with the musicians who have pursued their art, the two worlds often merge. Drs. Bose and Pacia have taken care of artists medically and have patients with an interest in art who frequent their gallery. Drs. Lederman and Charness performed with other neurologist-musicians at the AAN Annual Meetings from1992 to 2000. Until their funding was withdrawn, the number of participants grew each year and, at its peak, there were about 18 neurologists performing including members of the jazz group, The Oligoclonal Band. from air. Veida, Veida, listen to me. librarian, re-building spines of orphaned books. than speech, the vespers of silence.